After visiting Porvoo and Helsinki, we spent two days in Nuuksio National Park, just around the corner from the Finnish capital. Sleeping on trees, midnight swims in a lake and the best smoked salmon ever are only some of the awesome things we experienced in Nuuksio. Helsinki locals are lucky. 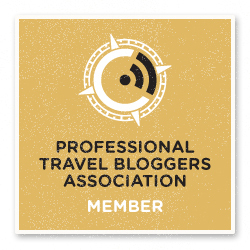 Not only is their city blessed with hundreds of islands offering some of the best urban nature we’ve ever seen – there are also two national parks within day-trip distance. The closest park to the city is Sipoonkorpi National Park, a wild woodland where trails and signage are approximative at best. 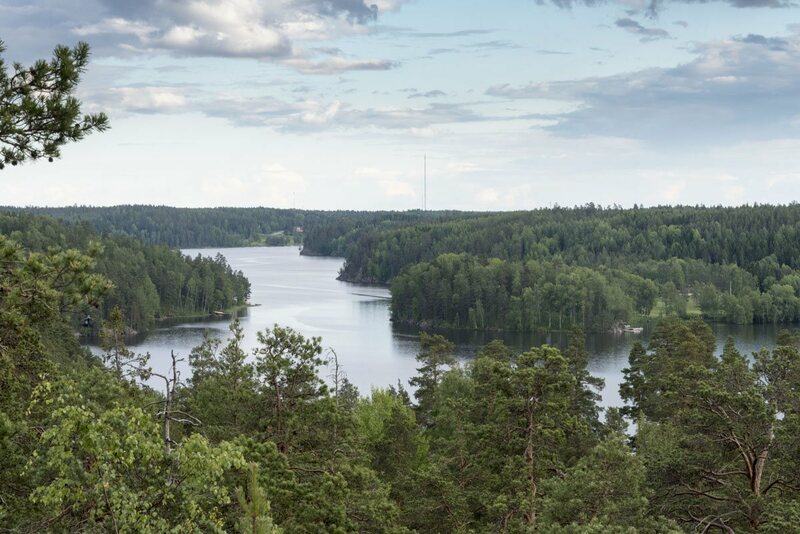 If you’re not quite up for something so challenging, your best bet will be Nuuksio National Park, a short distance from Espoo and Helsinki. Nuuksio is a true gem. 53 square km of stunning nature, including cliffs, forests and shimmering blue lakes, accessible even to the least ‘outdoorsy’ types thanks to excellent trails, signs and maps, with many activities available for everyone. 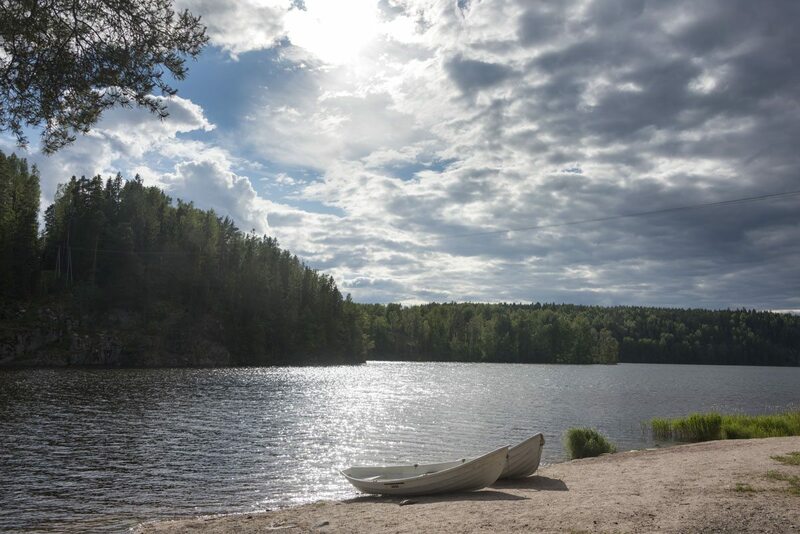 Besides hiking and camping, it’s possible to go cycling, kayaking, mushroom and berry picking, geocaching, horse riding… check out Nuuksio’s official site to get an idea of how truly awesome this place is. 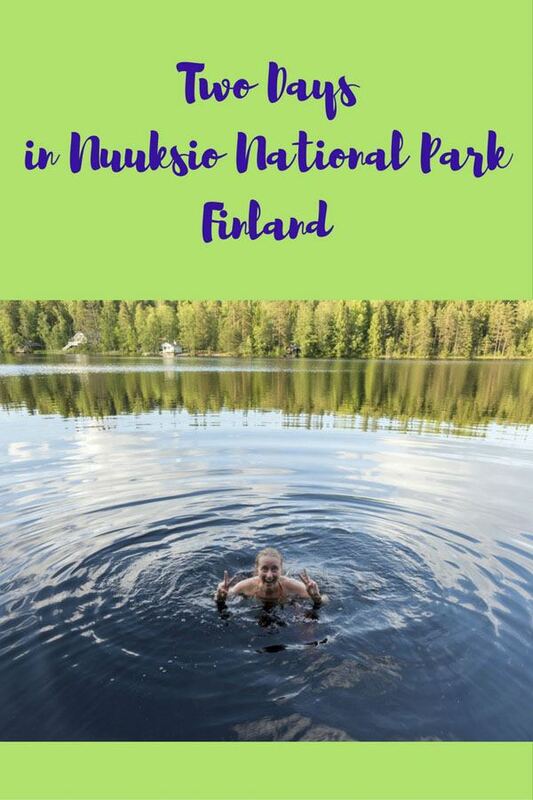 During our recent summer adventure in Finland, we spent two days in Nuuksio National Park, hiking, sleeping in the forest and basking in the glorious Finnish summer. 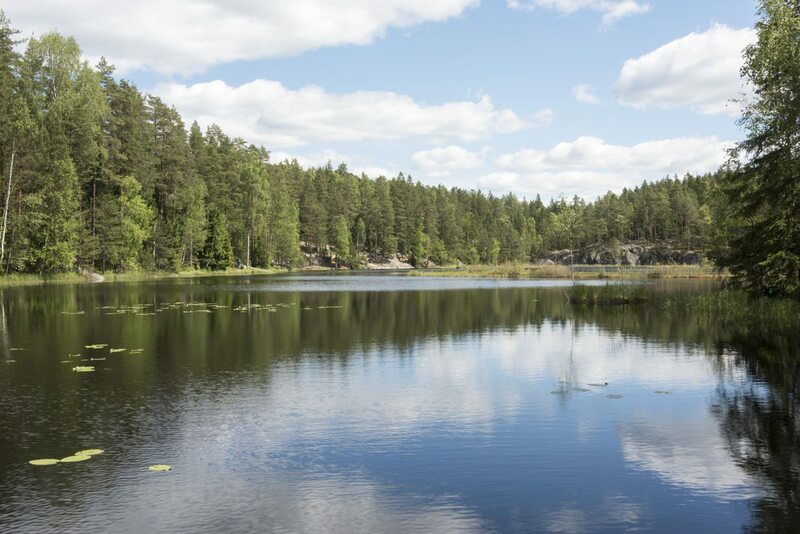 Most people just visit Nuuksio as a day trip by bus or bike from the capital and prefer to stay in a cool Helsinki design hotel, but spending the night in the forest and exploring without having to worry about a bus back really allows you to enjoy the peace and silence of nature. 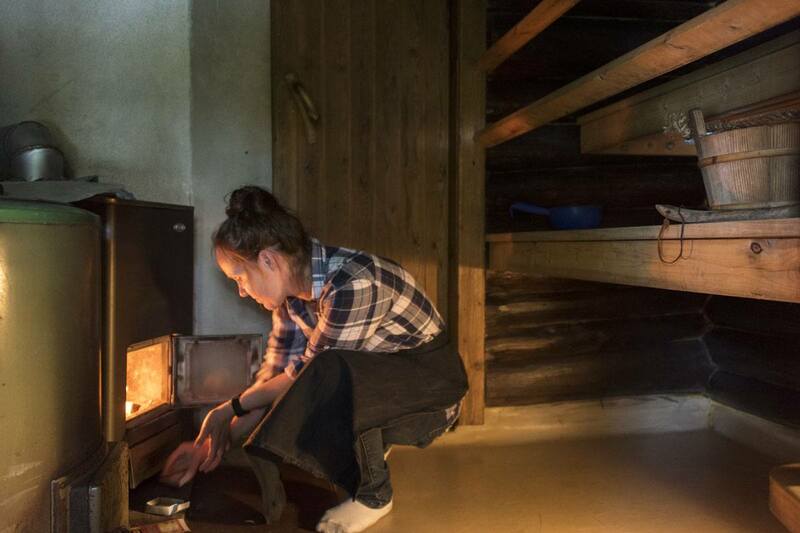 Here’s how we spent two days in Nuuksio – and could easily have spent more. 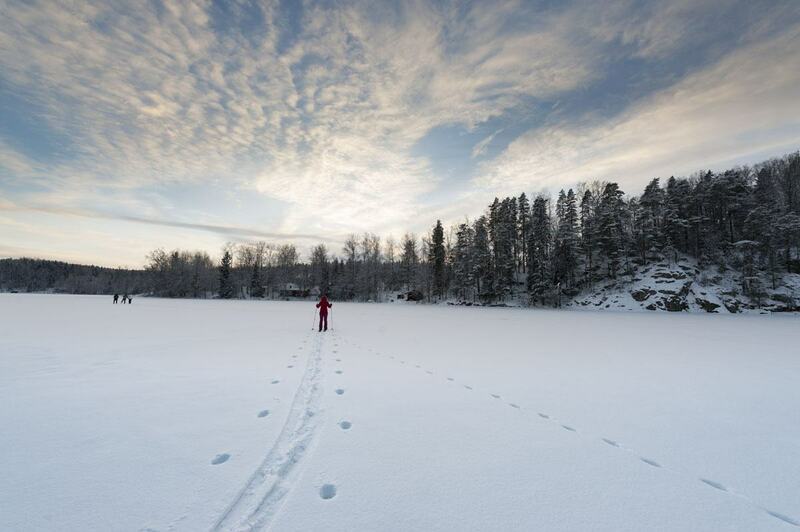 The jump off point to visit Nuuksio is Espoo, Finland’s second largest town located just west of Helsinki. We hiked from Helsinki to Espoo following one of many cycle paths heading west, surrounded by wildflowers and bumblebees on a glorious sunny morning. 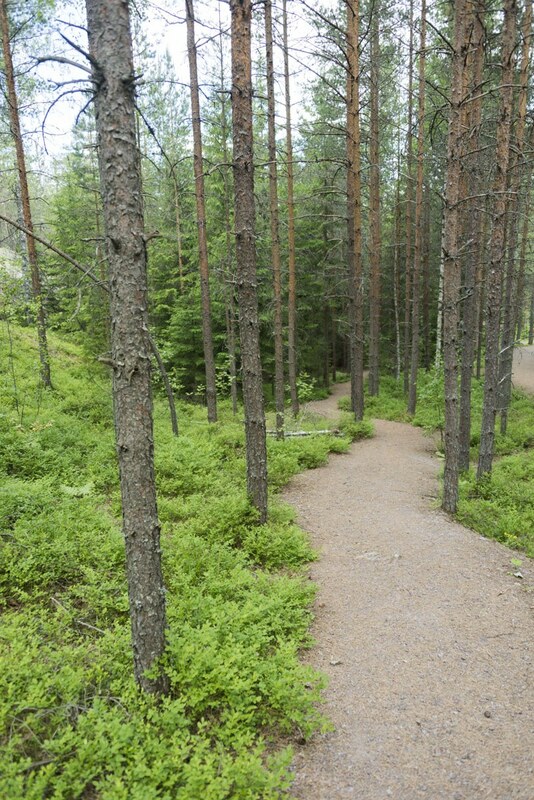 Once in Espoo, we followed another cycle path heading north to Nuuksio. 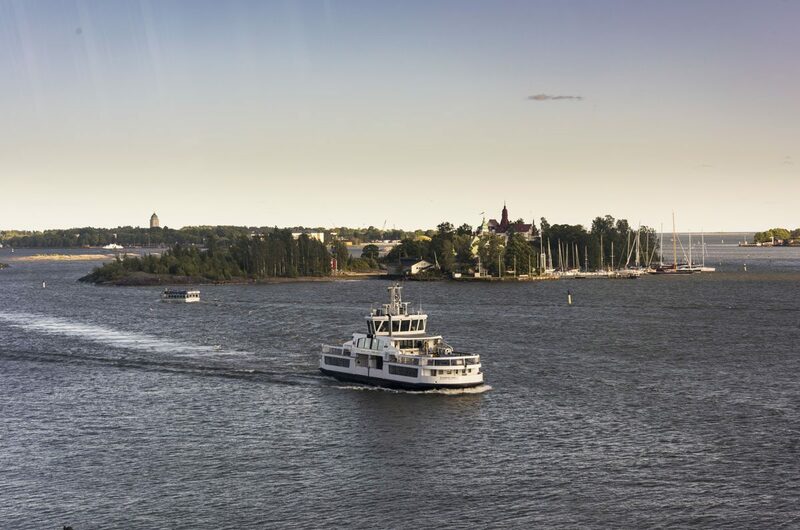 The distance between Helsinki and the entrance to Nuuksio National Park is 31 km, following a cycle path that crosses Lauttasaari Island and Espoo. 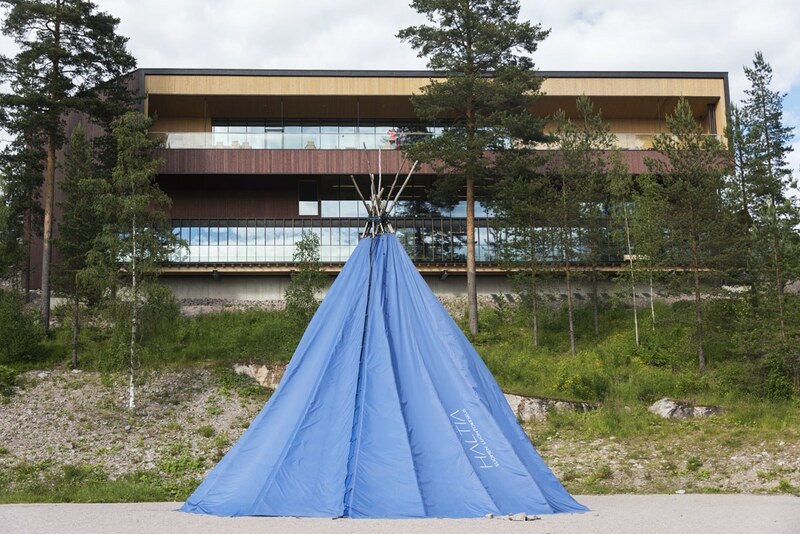 At the entrance of the national park the first thing you’ll notice will be Haltia Nature Centre, a duck-shaped building housing a visitor centre providing info about Nuuksio and all Finnish parks, as well as exhibitions dedicated to Finnish nature. The unique shape of Haltia is related to the Kalevala, the Finnish epic poem. In one of its myths it explains that life was born out of a duck’s egg. Water birds, like swans and ducks, appear in the myths of several Nordic countries, because of their ability to move between water and sky – the two domains of gods. The most striking feature of the Haltia building is its lookout tower, called Pohjannaula, meaning North Star in Finnish. In ancient Finnish myths the sky was believed to be held up by a pillar attached to the North Star – nowadays, the tower offers visitors a beautiful view over Nuuksio and its lakes, and is the entrance to the green roof that contributes to create ecological balance between Haltia and the surrounding ecosystem. 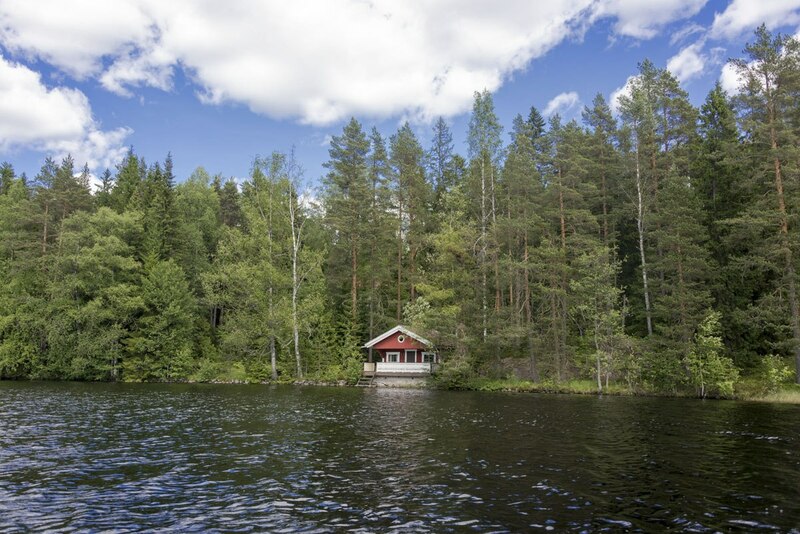 You can crawl into makeshift bear dens, listen to owls tooting in the night, surround yourself with awesome 360 images of Finnish nature and watch a top timelapse video that will leave you longing for more Finnish nature. 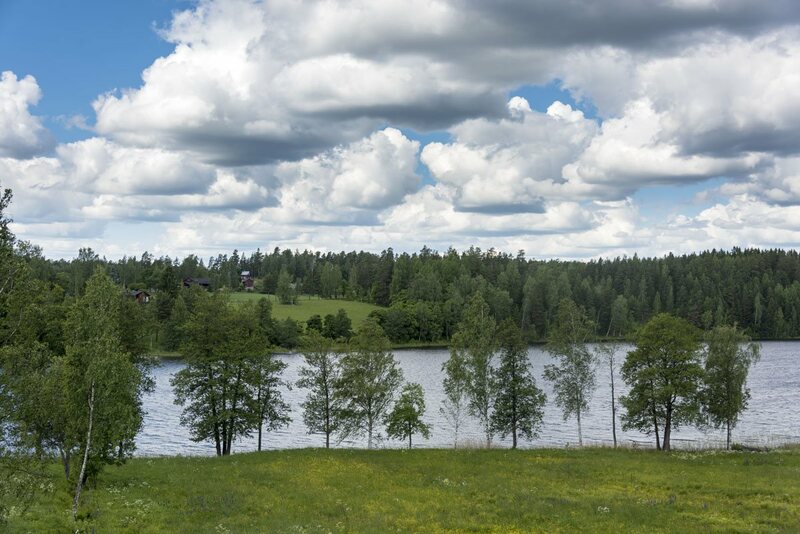 We visited Haltia twice this year, once during our winter visit to Helsinki, when we went skiing on the frozen lake, and again in summer – here are two images of the same lake, just to give you an idea of how much it changes between summer and winter. 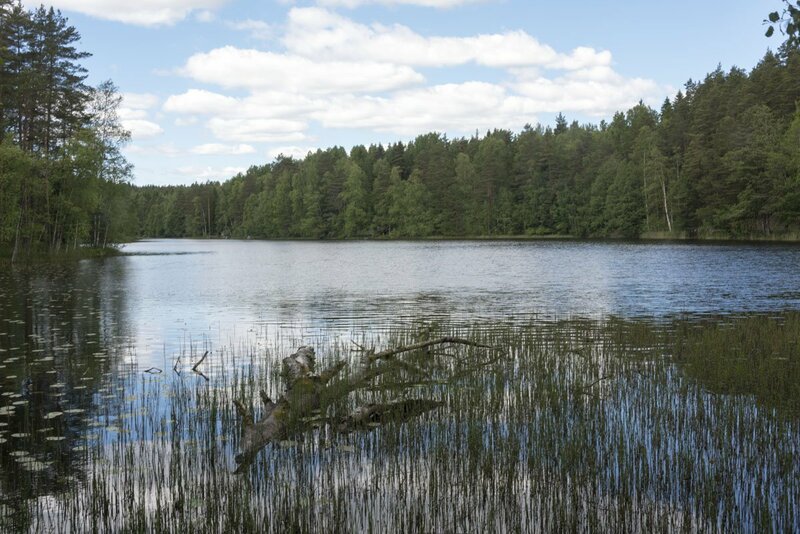 The lake closest to Haltia in summer…. And the same place in winter! 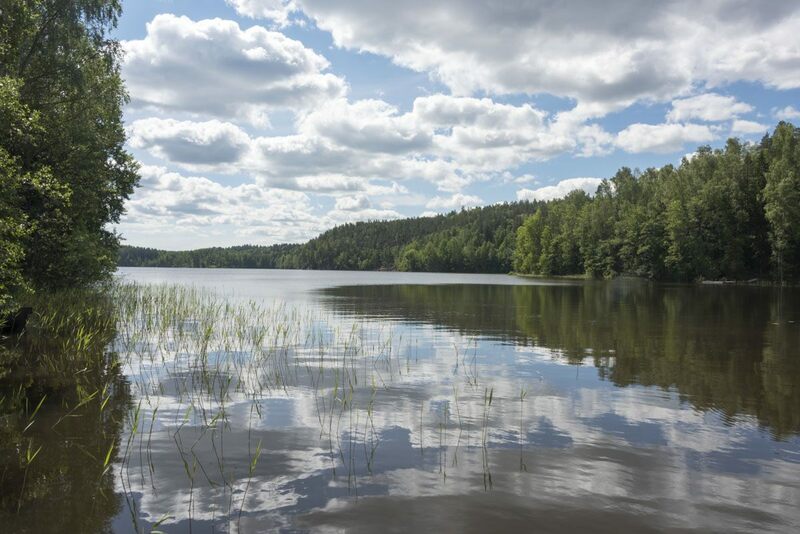 There are several campsites within the boundaries of Nuuksio National Park where you can stay for free. 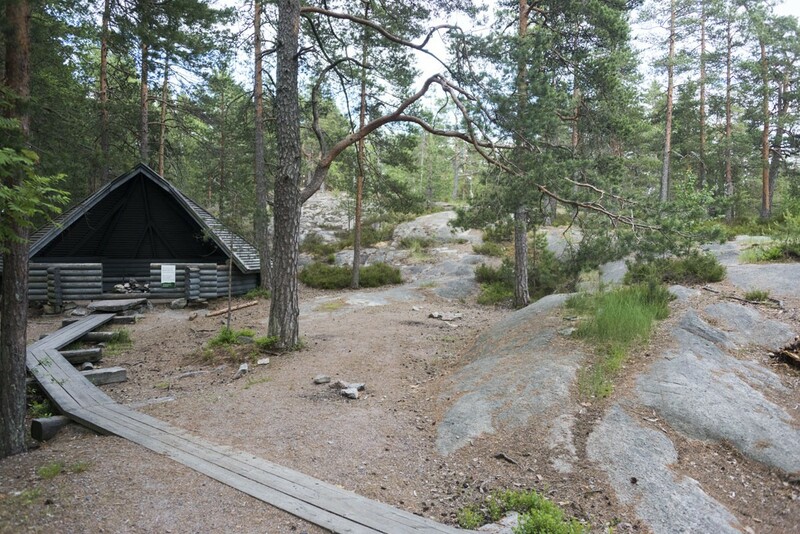 There’s always wood provided for free by the Finnish government, and a fire pit where you can cook on an open fire – provided a fire ban is not in place. Campsites are large and unless you’re visiting on a weekend you won’t usually have to share your space with many others, but if you’re looking for something really special and romantic, I have exactly what you need. Have you ever seen one of them? 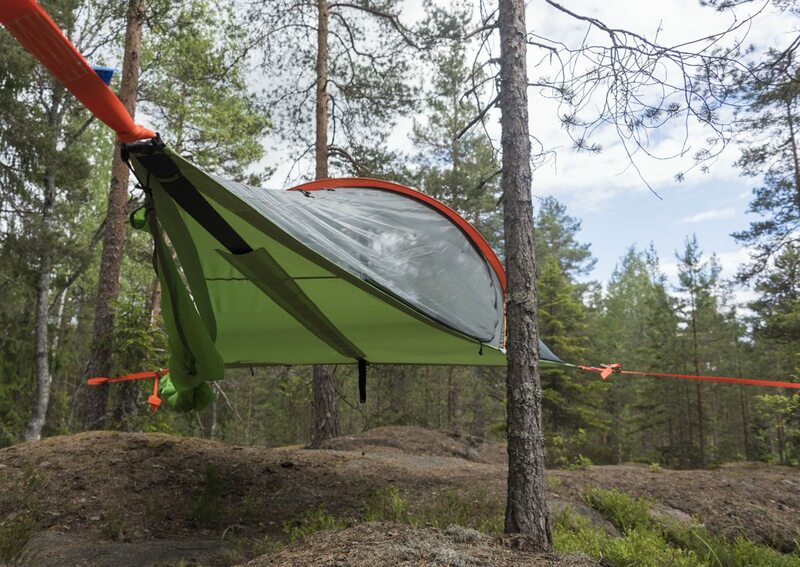 In Nuuksio, there’s the opportunity to hire out an entire campsite for a night and sleep in a tentsile, a kind of tent that allows you to sleep suspended from the ground and surrounded by the trees and the sounds of the forest. 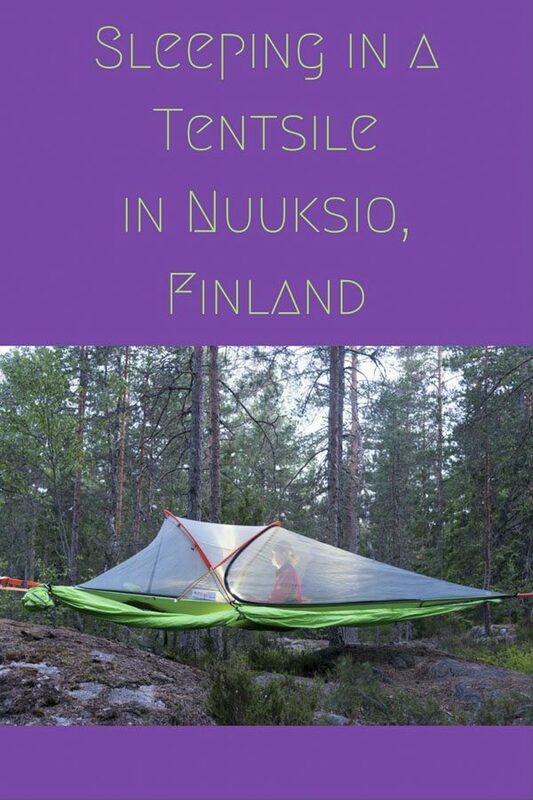 Tentsiles are very heavy and impractical if you’re hiking, but if you want to experience a night in one, Nuuksio is the ideal place to do it. 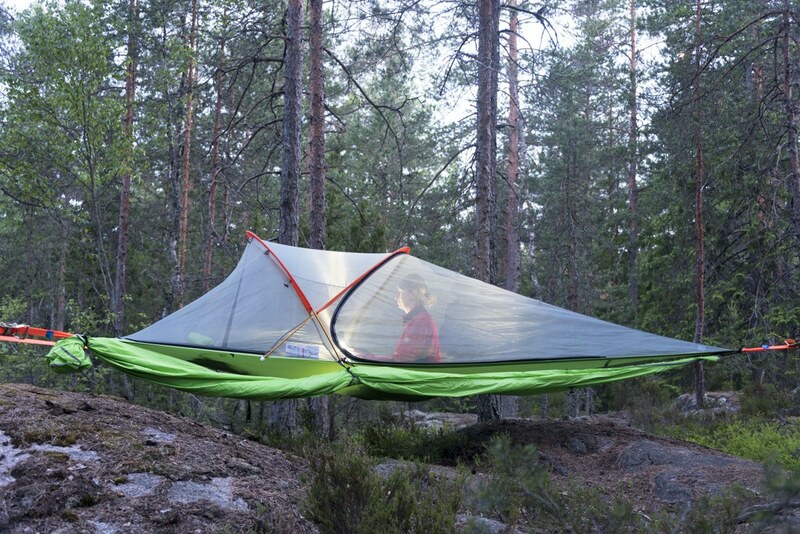 Markkus from Honkalintu will set one up for you, and leave you some food for dinner and breakfast, as well as cooking tools if you don’t have your own, allowing you to enjoy your night in nature in total solitude. Our tent was set up in a secluded campsite, barely 10 minutes walk from Haltia. 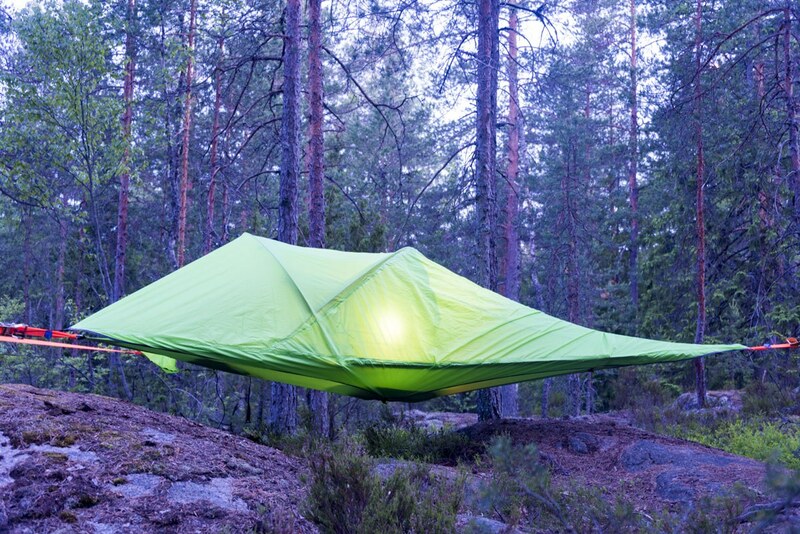 We reached the campsite in the evening, and after a quick dinner we lay in our tent witnessing the forest slowly change colour, as night never fell during those magical midsummer days. We kept our eyes peeled to try and spot a Siberian flying squirrel, symbol of the national park, but it eluded us. At midnight, the forest was a hazy purple. We removed the tent cover and fell asleep surrounded by the sounds of nature. It was chilly, but worth it – and in the early hours of the morning, a concert of birdsong woke us up, ready to welcome us into a new day in nature. The best way to enjoy the variety of landscapes in the national park is hiking across it. We walked from Haltia to Kattila, a distance of less than 10 km – but somehow, the hike was more strenuous than the 30 km we did the previous day. 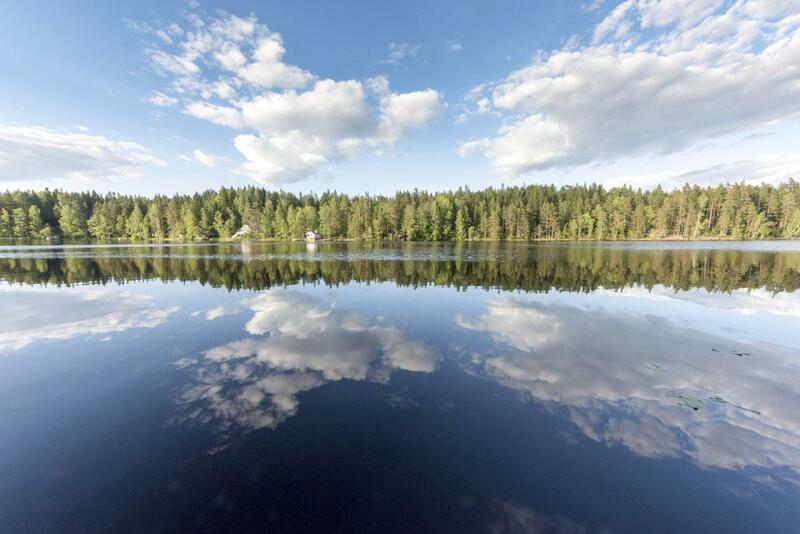 Yes, there are many lakes in Finland. 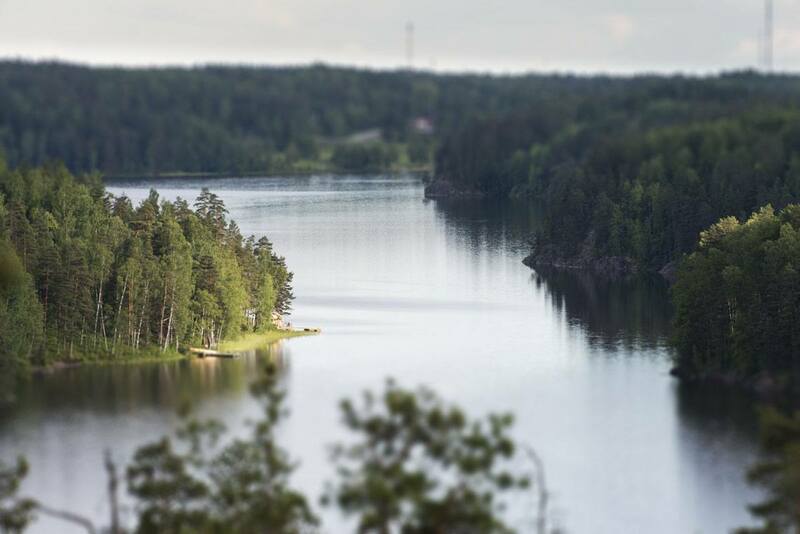 One of Nuuksio’s special features are its granite cliffs overlooking lakes and forests, offering sprawling views with no towns or cities in sight. The trail we followed went and down continuously, up a cliff and down another. We crossed pine and fir forests, all trees standing straight like diligent little soldiers, and patches of birch trees, slimmer and suppler, with their canopies blowing in the wind. We stepped on rocks bejewelled with moss and lichen, looking like splashes of watercolours – the moss was as dry as sandpaper, and crumbled beneath our steps. Halfway down the trail, we reached Mustalampi, a lake with floating turf islands. From the place where we stood, we could see these ephemeral islands in the distance, looking like a fata morgana between water and sky – but if we squinted, or looked into the zoom of our cameras, we could make out the island, with small trees and shrubs, and birds basking in the sun. 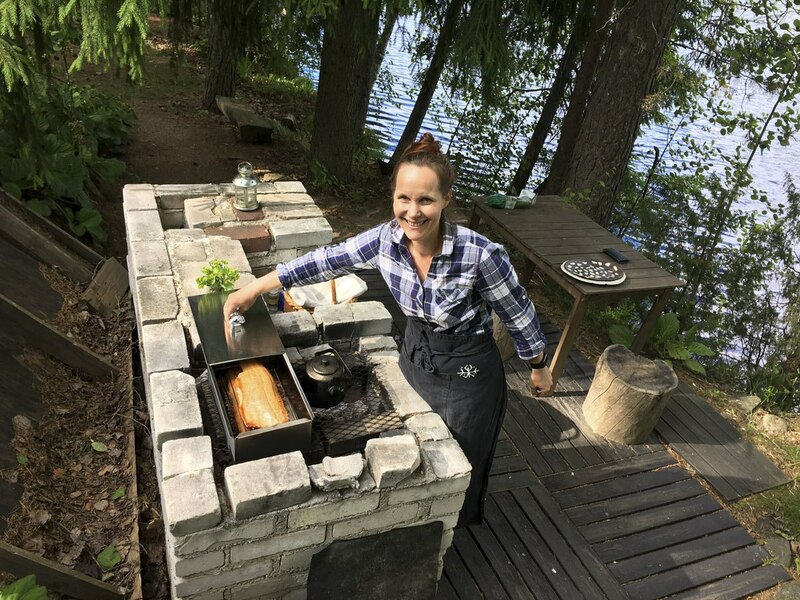 When we reached Kattila we were greeted by Annu, owner of Hawkhill Nature, offering accommodation and activities in a beautiful location on the edge of Nuuksio National Park. 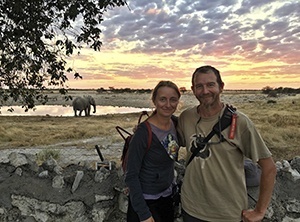 We were exhausted after the previous two days hike, and looking forward to resting in a quiet lakeside location, until our march would resume the following day. Annu took us across the lake by rowing boat, and told us the story of Hawkhill Nature. The land was purchased by her grandfather, who settled in the area after his home village in Karelia became part of Russia after WW2. Annu’s grandfather built a cottage, and then another, and another – he even built a road, and started offering accommodation to hikers and nature lovers. 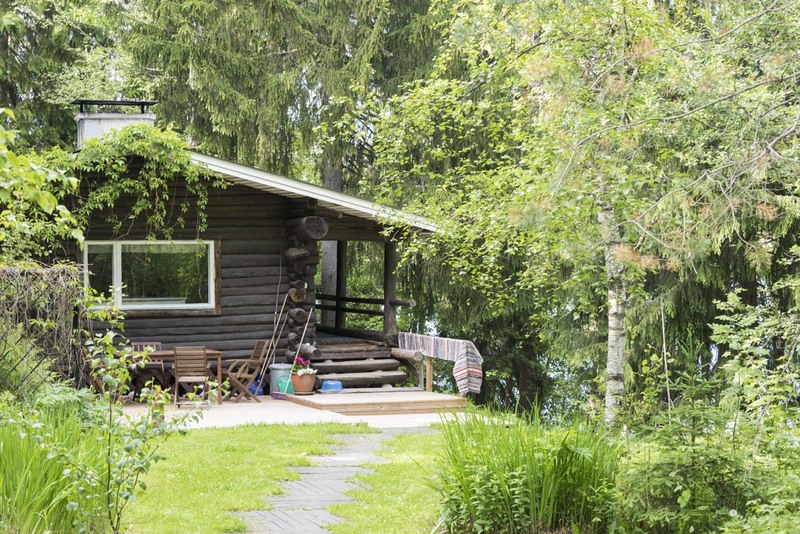 Nowadays, there are 6 cottages at Hawkhill Nature, all close to the shore of Kaitlampi lake, each of them with a private pier, a sauna and a rowing boat. Our cottage was Villa Armas, one of the oldest, built by Annu’s grandfather with wooden logs and a traditional wooden sauna next door. The toilet was an eco outhouse, just off the back of the cottage. So we had a sauna indoors, but a toilet outdoors – so typically Finnish! Macro nature near our cottage – some cloudberries! Our cottage of Hawkhill Nature was the perfect place to spend an afternoon relaxing, watching the clouds travel across the mirror expanse of the lake. 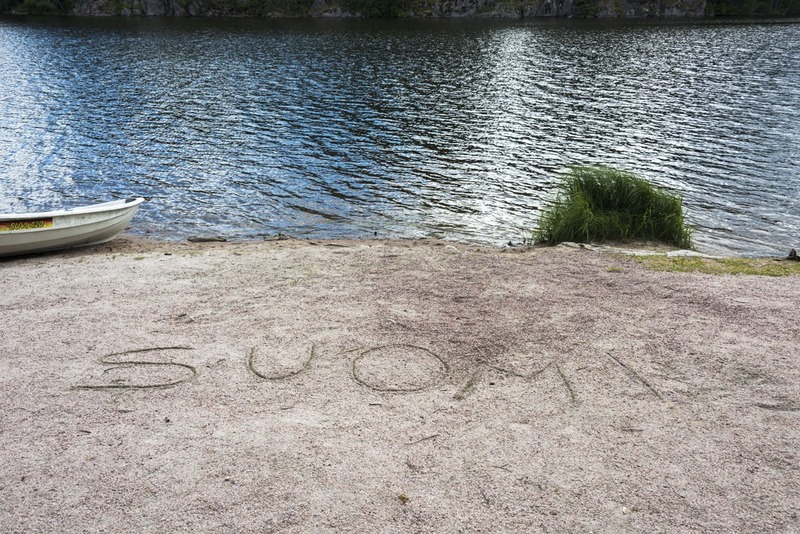 However, when Annu’s sister Kaisa invited us for a hike, we couldn’t say no. 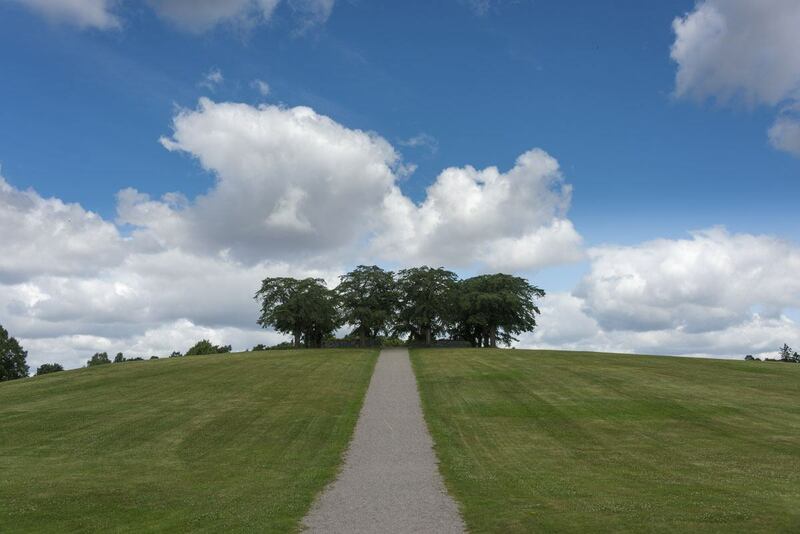 She explained that the name Hawkhill is the English name for ‘Haukkamäki’, a nearby hill. 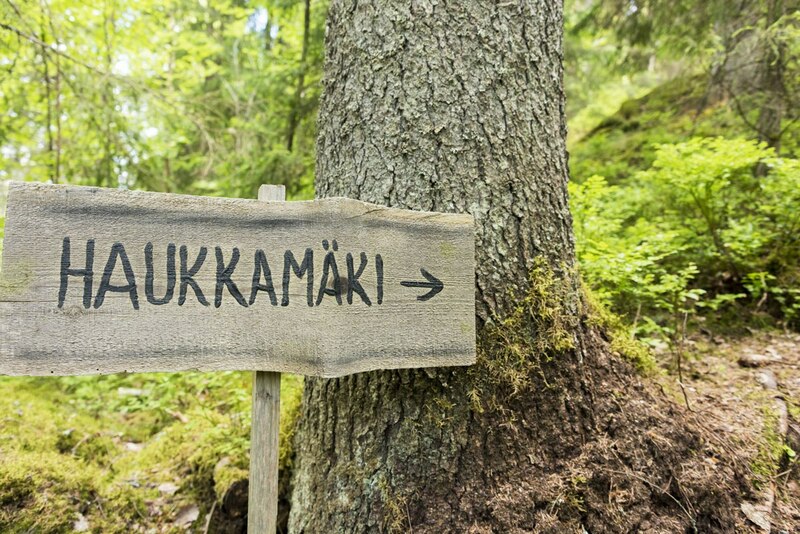 We walked to the top of Haukkamäki, where the verdant treetops framed the deep-blue waters of Kaitlampi Lake below. 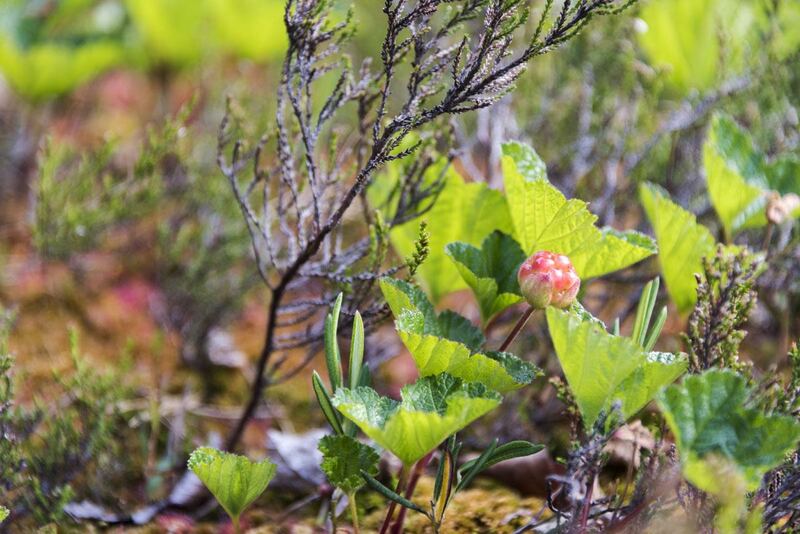 Kaisa showed us mustikka plants, looking like dwarf trees in the undergrowth, their oval-shaped leaves with rusted, crumpled edges. 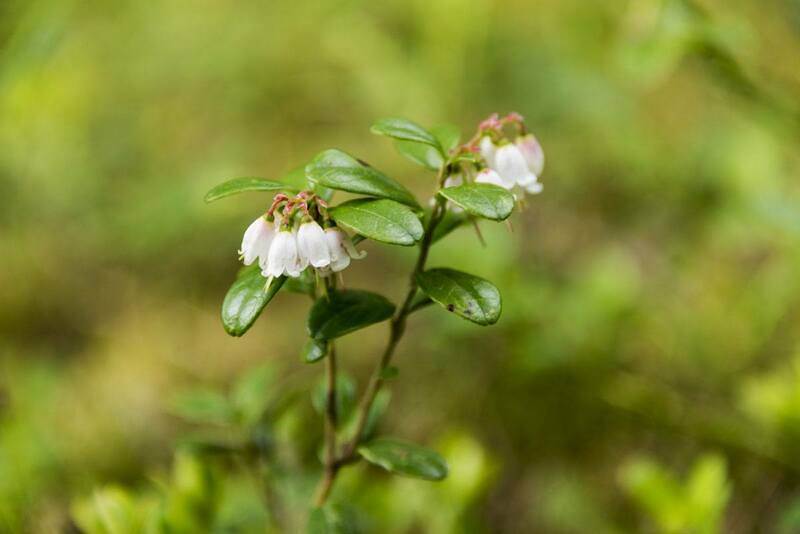 Soon the plants will be laden with tiny indigo berries – they’re called bilberry in English, not blueberry, she explained. Kaisa had the eye of a real naturalist, glimpsing things invisible to us. She showed us a miniature rock garden, where little carnivorous plants, bright red and shiny, sat waiting for bugs to get trapped. 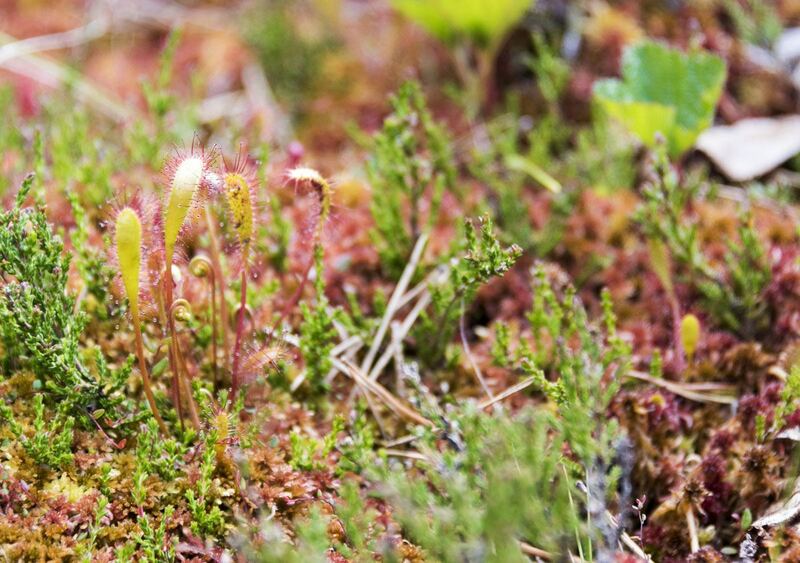 Can you spot the carnivorous plants? Soon, the terrain changed underfoot. Gone was the crunch of dried lichen. We stepped into a mire, soft and spongy with soaked moss. 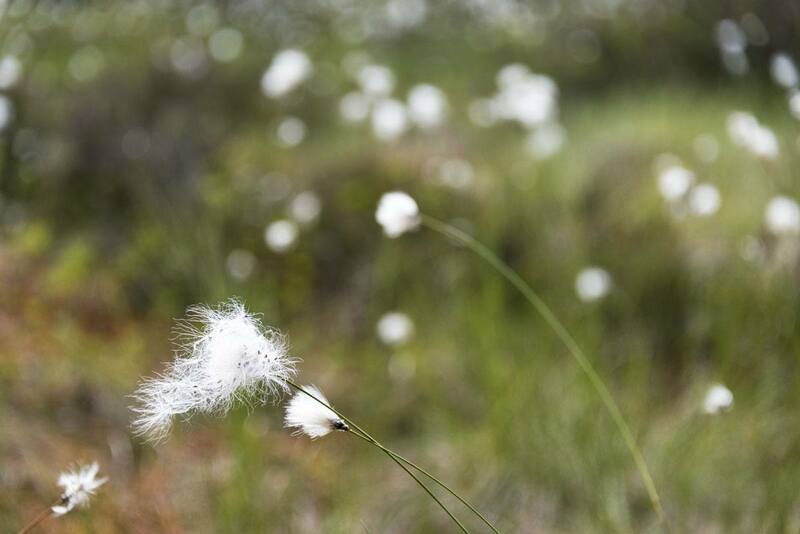 The mire was dotted with fluffy wild cotton flowers, heads bobbing in the breeze. 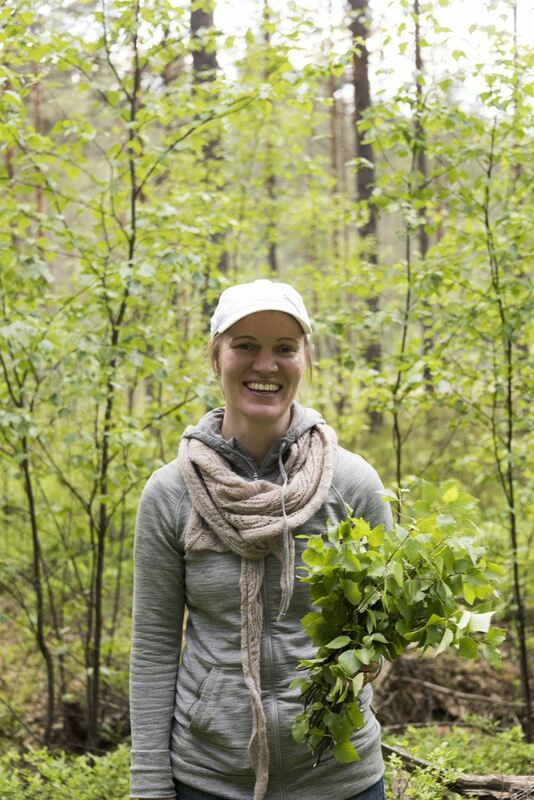 Kaisa led us to pick branches to make a vihta, a traditional sauna whisk that we could use after we returned to our cottage. Annu was stoking the sauna fire for us, she said. The rest of the evening was pure bliss. 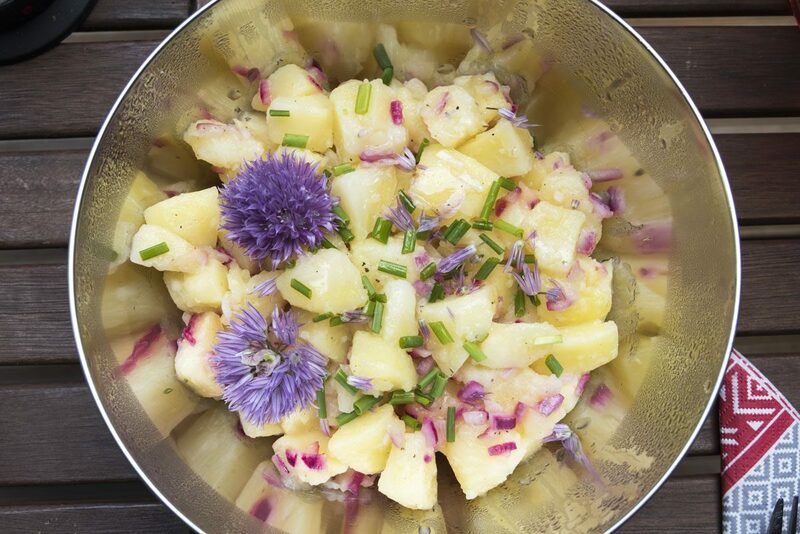 Annu smoked a side of salmon for us, and we ate it outdoors, together with salad and potatoes decorated with wildflowers. 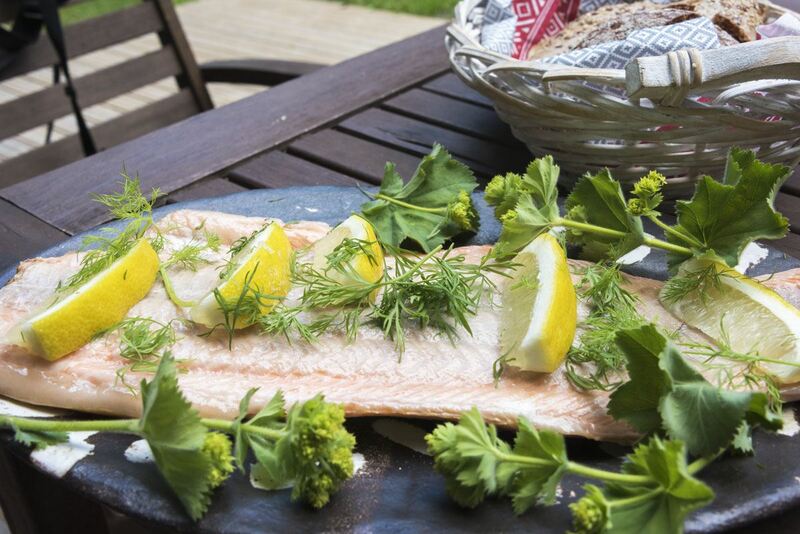 The best smoked salmon of my life – still warm from the smoker, with the scent of tree sap. 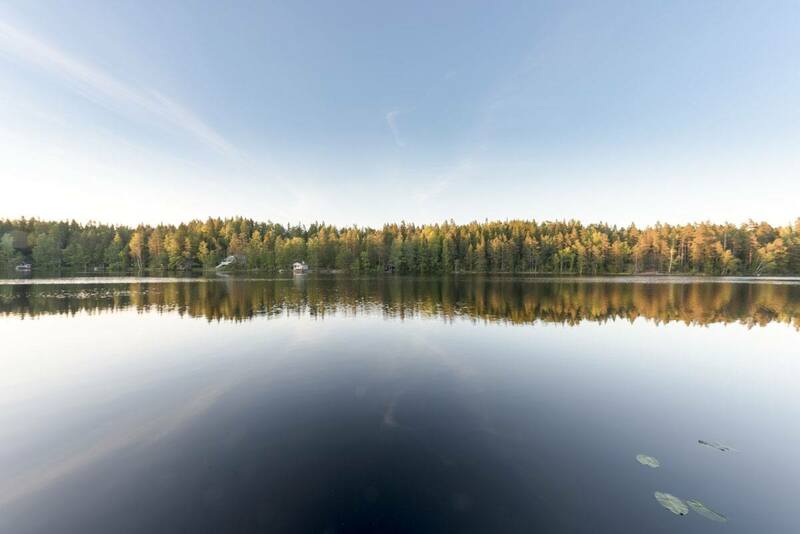 I sat in the wood sauna until my eyes stung from the heat, whisking my back with the vihta, then jumped into the lake, while the sky got darker – blue turned into indigo, indigo into deep purple, and the tops of the pine trees across the lake were lit with the fading sunset light. We sat and looked at the sky, until the sun disappeared and all that was left was light across the horizon. The sky was dark blue, with a few wispy clouds looking like brushstrokes of black watercolour. The lake was a perfect mirror, still and silent, like our souls in that perfect, rare moment. We would like to thank Visit Espoo and Haltia for having hosted us. All opinions are our own. It looks like an interesting place to visit. Great photos!